SA – Stefan Acatrinei OFM CONV taught at the Franciscan International Study Centre, Canterbury. ESB – Eleanor Billingsley teaches reception class children, aged 4 to 5. MMB – Maurice Billingsley is married to Janet; they have four adult children and one grandson. Maurice took his MA in Theology at the Franciscan International Study Centre, Canterbury, writing about Sacrifice in War. He worked with vulnerable children for many years. NAIB – Dr Naomi Billingsley grew up in Canterbury, studied in Cambridge, London and Manchester, was the first Bishop Otter Scholar for Theology and the Arts in the Diocese of Chichester, and is now following post-doctoral studies at John Rylands Library, University of Manchester. 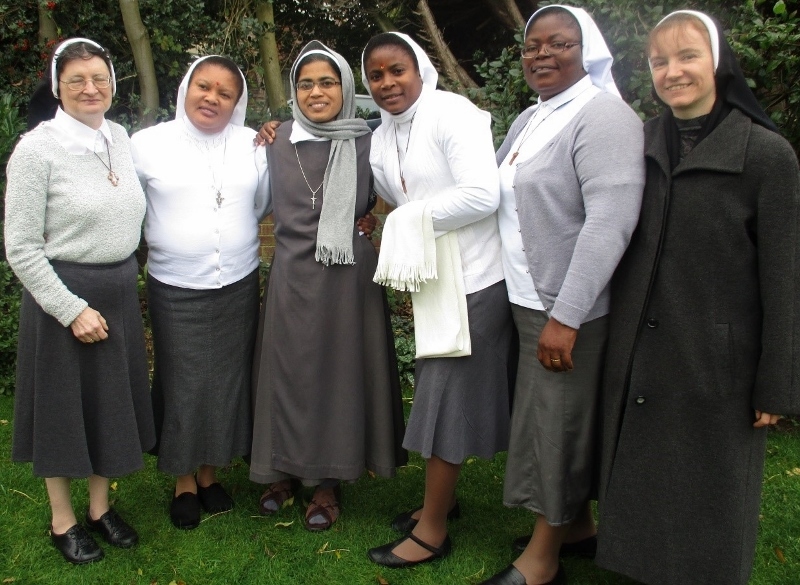 SJC – Sister Johanna Caton OSB is a member of the Benedictine Community of Minster Abbey, near Ramsgate. See the link on the right. SMS – Sister Mary Stephen OSB is another Benedictine of Minster, and a poet. See the Reviews page for TJH’s appreciation of her book, The Trouble with not Writing Poetry. CC – Christopher Chapman worships at the Franciscan International Study Centre and is a retreat leader. CD – Brother Chris Dyczek OFM has been a student and teacher at the Franciscan International Study Centre, Canterbury. He now leads the Centre’s Distance Learning Programme. VE – Fr Valentine Erhanon is a priest of the Archdiocese of Southwark. After his ministry at Saint Thomas’ parish, Canterbury, he has been appointed as a Catholic Prison Chaplain. He now serves at Her Majesty’s Prisons in London. Valentine will be sharing poems and other reflections. TJH – Brother Thomas Herbst OFM taught at the Franciscan International Study Centre, Canterbury, and holds summer courses in Doug Woelke’s parish in California. He will be teaching at other institutes in England from September 2017. AMC – Anne Man Cheung has been a wife, mother, teacher, counsellor; and she contributed to the Ecumenical Training Programme in Spiritual Direction at the Franciscan International Study Centre. AMcC – Austin McCormack’s sixty years as a friar have seen him serve in many ministries including parish work and teaching. After teaching at the Franciscan International Study Centre until June 2017, he is now based at the Friary in Woodford Green, Essex. JMcC – John McCluskey MHM is a Mill Hill Missionary, formerly based at St Anselm’s Institute, Cliftonville, Margate, now teaching at its successor institute in Rome. Sister Margaret McGrath FMSJ, BA MA, is a Franciscan Missionary of St Joseph, and Chair of Formation for the UK and the Netherlands for her Congregation. She was for many years Director of the Franciscan Studies Programme at FISC and Vice Principal. She also directed the Ecumenical Training Programme in Spiritual Direction. Sister has many years of experience in accompanying others in Spiritual Direction and in the giving of Directed/Guided Retreats. DBP – David Bryn Powell is a Kentish Welshman, student and friend of the Franciscan International Study Centre, and a raconteur. PR – Pauline Ryan is married to Charles and worships and studies at the Franciscan International Study Centre, Canterbury. MLT – Monica Tobon teaches at the Franciscan International Study Centre, Canterbury and is a scholar of Saint Evagrius. WT – Will Turnstone is a pseudonym. DW – Doug Woelke and his wife are parishioners at Old Mission San Luis Rey in California which is linked to FISC through TJH. Doug used to be a submariner in the Navy. He is on the RCIA team at the parish. DWy – Daniel Weatherley is a priest of the Archdiocese of Southwark, at present assistant priest at Saint Thomas’ Parish, Canterbury.